Suzanne Masefield is a body-mind specialist, micro-expression trainer, clinical hypnotist, and counselor. In this episode of The Sales Podcast she'll share with you her tips for changing how you feel just by changing your posture, how to control your own state, so you can create read the state of others to make more sales. How to manage your own state of mind and being. How to be prepared for your sales appointments. How to be the influencer in any sales situation. How to change your own feelings with your posture and physiology. How to make better connections with the tone of your voice. How to present yourself as "open" to your prospects. The difference between a "low power" pose and a "high power" pose. How to recognize "clusters" in the body language of your prospects. How to increase the endorphins in yourself and your prospects to build better connections and close more sales. Visit Suzanne Masefield's home on the web and get her free body language cheat sheet. 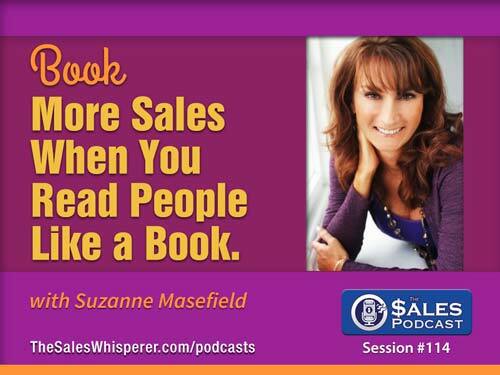 Enroll in Suzanne's one year mastermind. Share your appreciation for this episode by letting my guest and me know on Twitter.